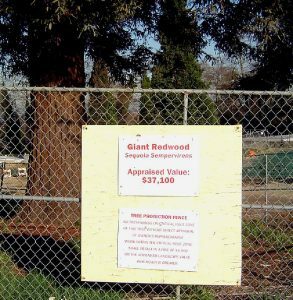 Protecting worthy trees on any construction site is a challenge. Even after you convince the importance of tree protection to the owner and the site supervisor, it is unlikely you will be around to inform or enforce proper tree care with the sub-contractors working near the trees. We found that appraising the trees and clearly showing a dollar value on Tree Protection Signs helped to bring awareness to most sub-contractors working around these trees. After these postings, I was more likely to get a call saying something like “Hey, I am working near atree that has a large price tag on it, and I don’t want to be blamed for hurting it. What can I or can’t I do?” It is great to see that these signs are at least prompting people to ask the right questions. An organization in Seattle liked the idea so well, they added $20,000 to the appraised value of each tree to raise even more attention. Of course the warnings have to be backed up by actions and enforced penalties!